• Partner with the Manheim Library to relocate its operations to Pleasant View’s campus, adding vibrancy and intergenerational interaction throughout the campus. sell Pleasant View grown produce and specialty items and encourage additional connection with the community. 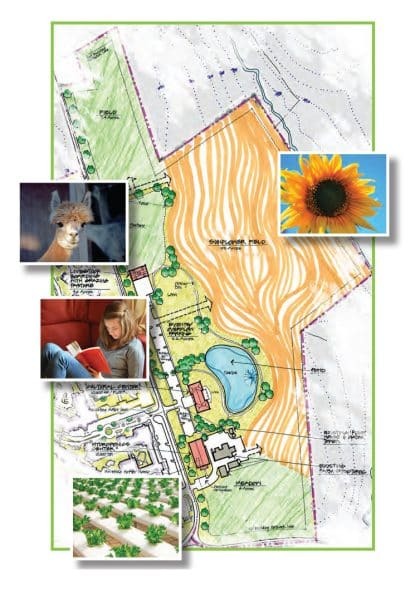 • Evaluate benefits of devoting a portion of this parcel to the cultivation of sunflower gardens, orchards, honeybee cultivation, or raising livestock. • Partner with local school districts and social service organizations to create opportunities for agricultural education and employment. When we are a strong organization, we can be a significant asset to the broader community. Consider development of dining options that can be marketed to the broader community. Evaluate opportunities for development of child daycare. Focus on issues of benevolence, affordability, and social accountability. Create a club for outside community members offering a broad range of activities and services and consider the development of a continuing care, or life plan, at home contract option attractive to community members who want to remain at home. Explore other opportunities for partnerships and/or joint ventures.